Being a single mother is nothing new. However, can you imagine being one in any other era than the present? In times before women had any say? Had any rights? 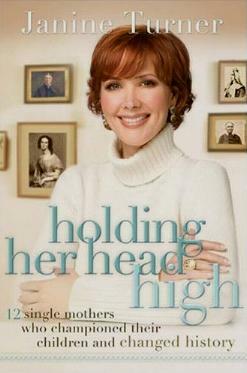 Janine Turner, herself a single mom, has written about a variety of women, who through the ages, were single mothers. Twelve of whom Turner says, "...embraced the birth of Christianity, ruled countries, endured wars, birthed a country, withstood torments of slavery, pioneered west, and battled inequities of men's and women's rights". Turner starts her list of twelve with Saint Helena Augusta (AD248-330), mother of Constantine. It's rather like an intimate history lesson on women through the ages, for not only does Turner write about these particular women, but what was going on around them at the time. None had it very easy, but all were strong and resilient. Others you can read about are Isabella Marshall Graham (1742-1814); Abigail Adams (1744-1818), and Aunt Clara Brown (1800-1885) among many other incredible-for-their-time women. Not only were many of these single mothers resourceful, they were benevolent and caring of others. "Single mother" doesn't mean unwed mothers, but also abandoned, widowed, divorced, and husbands who went off to war. This book is heavily faith-based, and Turner doesn't miss an opportunity to mention God and how great He is. A portion of the proceeds of this book goes to charity. Conclusion - Apart from great lessons in history, quite a reassuring read.